2015 Hyundai Eon Facelift Spied- Up For Makeover Soon? 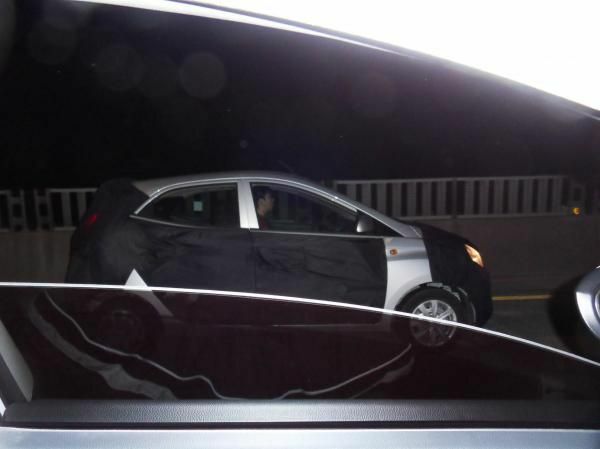 2015 Hyundai Eon facelift has been caught testing in Korea. The hatchback car market is quite competitive in India with numerous cars equipped with advanced specifications at affordable prices. Having seeing the competition from Maruti Alto k10 and Datsun Go hatchback, Korean manufacturer Hyundai has already started bringing some tweaks in its Eon hatchback. It is expected to be launched in 2015. The camouflaging of the car in the spy shots suggests that there might be tweaks only in the front and rear of the car like bumpers, headlights and taillights. It is expected to continue with similar mechanical specifications and slight changes in the interiors. Since its launch in 2011, Eon has not undergone any major changes. The ongoing version of Hyundai Eon comes powered by 814 cc three-cylinder petrol engine that produces 56 PS maximum power at 5500 rpm and 75 Nm of peak torque at 4000 rpm. It is mated to a five-speed manual transmission with a fuel capacity of 32 litres. Also it is sold with 1.0 litre Kappa II engine producing 69 PS of maximum power at 6200 rpm and 91 Nm of peak torque at 3500 rpm. The dimensions of Hyundai Eon are 3,495 x 1,550 x 1500 x 2,380 mm (length, width, height and wheelbase respectively). The facelifted Hyundi Eon might boost up the company’s sale while competing in the fiercely competitive market with Alto K10 and Datsun Go. Alto K10 is powered by four-cylinder 998 cc engine that produces 68 BHP of maximum power and 90 Nm of peak torque, mated to a five-speed manual transmission. It is now available with AMT (Automatic Manual Transmission) as well, based on Maruti Celerio, which enables the driver to have a stress free ride without the need of pressing the clutch again and again. Seeing the popularity and AMT craze among Indian buyers, this is an advantage to Alto K10 over other hatchbacks without AMT. While Datsun GO is powered by a 1.2-litre engine that produces 67 BHP of maximum power and 104 Nm of peak torque. It is mated to a five-speed manual transmission. Nissan is also going to launch its micro SUV based on Redi-Go concept in May 2015 which will be positioned between Datsun Go hatchback and Go+ MPV.